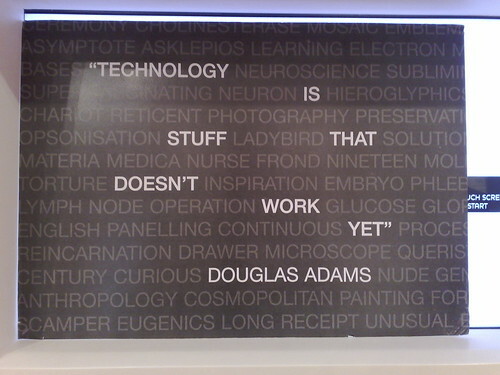 Technology Is Stuff That Doesn’t Work Yet. One of the things about the writing of Douglas Adams is that he had a keen eye for what was happening around him and could express it briefly: ‘Technology is stuff that doesn’t work yet.’ You can think about that statement as long as you want and find no real fault with it. Consider this: We don’t talk about fire technology. We don’t discuss wheel technology unless we’re dressing up a car, and speaking of which, most people are completely oblivious to internal combustion engine technology. Well, that’s the problem with defining yourself with ‘technology’. Technology is the stuff still being worked on. It’s not done yet. Some of us have to get it done, but we miss all too often – a sore point with me, where we write software that doesn’t really do what we want it to do.